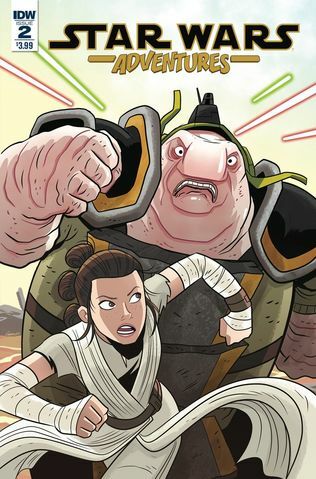 Home » Comics » Star Wars Adventures #2 Review! Star Wars Adventures #2 Review! Written by: JediJondee46 on October 1, 2017. The last issue from IDW Publishing had Unkar Plutt captured by Zool Zenidar looking for the head of a droid and about to be left to the mercy of ripper raptors! The second part of “Better The Devil You Know” is by Cavan Scott and Derek Charm. There is a full page split by panels getting readers up to date. Rey slides down to their ship and plants a com link from her bag. Zool is about to let the ripper raptors descend when there is a loud squawking noise, Rey with the comlink. The henchmen are distracted and Rey uses that to take them down with her staff! Nice action by Derek Charm. Still Rey is just about to deactivate Unkar’s restraints when she is shocked. She is of course taken down by Zool, his henchman have found the com link, but Rey has a bargaining chip – the head of the droid! They are not about to bargain and ready their blasters when Rey tosses the head up, nice closeup of the flying head with the other characters around it. Unkar Plutt spoils her plan throwing her into the burly Talz and taking the droid head. He picks up Rey’s packet of corn clusters and throws it. This of course brings the ripper raptors down on Zool and his men. Cross and double cross. Rey takes the droid head and bats it to one of the Zool’s henchmen. Zool takes his starship into space. Taking her speeder back, Unkar is angry at Rey, but she has an explanation. Rey also says that Krynodd has taken over Niima Outpost which gets Unkar stomping off. The next day, Rey is at her fallen AT-AT walker home, and Rey discovers a box that has Unkar Plutt thanking her in his own way. I think this is a fun story that really develops the relationship of Unkar Plutt and Rey without changing anything from the films. The next story continues Tales from Wild Space with “The Flat Mountain of Yavin” by Elsa Charretier, who also provides art, and Pierrick Colinet. Charretier has a cartoony art style, but it also reminds me of Darwyn Cooke, I really have to keep an eye out for Elsa Charretier’s work. We return to the Star Herald with young Emil Graf settling an argument between his droids with a story. A single panel shows us events from A New Hope and then we get the evacuation of Yavin base. Star Destroyers are in firing position as Princess Leia explains to a soldier that their fate rests in Evaan Verlaine. This is a great character introduced in the Marvel Princess Leia limited series. She is on the bridge of the Star Destroyer knocking out an officer while the other Rebel soldiers take over. Emil explains to his droid, Crater, that a proton bomb disabled the Star Destroyer enough for Evaan’s group to take over. The soldier argue over how to break the code lock on the Star Destroyer’s controls when Evaan tries to interrupt and then just goes running to the flight deck and takes her ship out. She has the ship ripping around in tight maneuvers and then has it locked on ramming speed towards the Star Destroyer! She takes an escape pod as the ship explodes. Evaan looks out of the escape pod window and sees that nothing has happened. The Star Destroyer fires on the Rebel base! Of course, this kinda changes the standoffish relationship between the two in the Princess Leia comic, but still fun. I just wish they did a series on Evaan Verlaine! Later, Emil makes an adjustment and restores the ship, lesson learned! The next issue teases a crazy purple alien throwing Finn’s stormtrooper helmet, there’s also a back-up story co-written by Alan Tudyk, can’t wait! Five Lightsabers out of Five!